Freshman Rep. Alexandria Ocasio-Cortez (D-NY) is pushing back against critics of her unnecessarily giant carbon footprint. The self-proclaimed "boss" of the progressive movement has been branded a hypocrite after the New York Post revealed on Saturday that despite championing the "Green New Deal" which calls for the elimination of fossil fuels - AOC and her staff have relied heavily on combustion-engine cars, racking up $29,365 in car services such as Uber and Lyft "even though her Queens HQ was a one-minute walk to the 7 train." 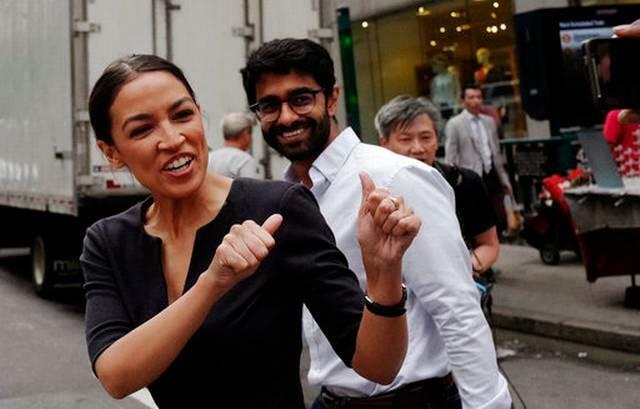 AOC's office also spent $25,174 forr 66 taxpayer-funded airline transactions, while she and her staff only took Amtrack 18 times "despite high-speed rail being the cornerstone of her save-the-world strategy." Her explanation for not even making an effort to reduce her carbon footprint? She has to use "present technology" in order to fight for the Green New Deal. On Saturday, AOC responded to the Post article, tweeting: "I also fly & use A/C," adding "Living in the world as it is isn’t an argument against working towards a better future." On Sunday, she knocked The Post once again, tweeting: "The Post put the fact that I get into cars (while proposing a plan to invest in better car technology) on their front page," adding "Pack it up folks, the Pulitzer’s been decided. No one can rival this kind of hard-hitting journalism." And on Monday, Ocasio-Cortez once again mocked her critics, tweeting: "I need to admit something to you all. Frankly, I don’t know how my environmental reputation can recover." only to reveal "Today... I wrote in a book... made out of PAPER." "Apparently using present technology means I can’t fight for new jobs, investing in infrastructure, & renewable energy." Notably, none of her comebacks include an explanation for why she hasn't attempted to practice what she preaches.